This week's topic is Explore. Since it is heads this week, we can interpret and do whatever we want with the topic. On Flickr, they have what's called "Explore". They use some funky-technological computations to determine which photos should make it into Explore, based on their "interestingness". I guess it would be sort of similar to Technorati and Page ranking computations. Anyway, it's all confusing. Here is what Flickr has to say about how they determine "Interestingness", and in turn, which photos belong in Explore. Besides being a five syllable word suitable for tongue twisters, it is also an amazing new Flickr Feature. We've added some pages (and changed some existing ones) to help you explore Flickr's most interesting photos. Before you start though, you might want to take your phone off the hook, send your boss to an executive training session and block off some time on your schedule, because we don't think you're going to be walking away from your screen any time soon. Beautiful, amazing, moving, striking - explore and discover some of Flickr's Finest." And here is a poster of my photos that have made it to Explore at some point in time. 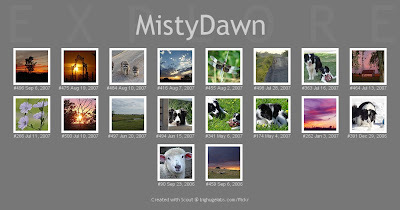 A few of them are still in Explore, but most of them have been dropped by now. 1. Painted Canvas 2. Cemetery 813 3. What's That Human Gonna Do? I really should use flickr more. I'm finding that my blog is becoming very photobloggish! Good idea for the theme! There was one day when I had 4 photos on Explore. I was excited. Now I fluctuate between 2 and 3. I must explore your pictures on Flickr. Question: do you have trouble with comment popups using Firefox? I haven't figured out if it's a browser issue or just my computer. I've started opening the comment link in a new tab, and that seems to be working. I use flickr but I shamefully admit I have not noticed Explore or interestingness. Your photography is awesome ... I want to go explore , EXPLORE on flickr now and see your shots fullsize! I love the puppy. Oh my gosh ... your puppy is adorable. I recently told my husband I want a border collie as our next dog (current model is Blue Cattle cross and 11yrs old).We have 15 month old twins and we will wait till they are a little older. What great pictures! I love the purple sky picture! What a great take on 'explore'! I loved your photos too, congrats! I need to do more with my flickr pages. I have pics on there of people I don't even associate with anymore LOL I had a different plan of attack on the theme, come see! nice to find link now..
nice pics you have in there.. I've explored some of flikrs photos, there are some good ones to see there. Good post for this weeks meme. I haven't used Flickr yet but now you have me intrigued. Have a great Tuesday, Misty. Very lovely! Thanks for sharin'! Great idea, Flickr Explore really let's you explore the photo world!!!! I'm not surprised that your photos made it to Explore, they're all gorgeous!!! didn't know about the "explore" on flicker....good take for HOT. Wow! I love that little lamb picture. He is just adorable. I enjoy using Explore on Flickr. I like using the cool photo layouts. You did a great poster. Thanks for sharing. I used to spend hours on flickr but now blogging has overcome me. I had 3 (or 4, the history varies for some reason) in explore. but they were not my best! They were photos favorited by cat people. i noticed that if i visited everybody that commented on my photos, then i could "push" it into explore. but i couldn't keep that up! now i just let it happen on it's own. and it ain't happening! sniff. so i KNOW you are good if they are getting in: especially that many! good going!